Nine years and three billion miles later, NASA’s New Horizon probe awoke once it neared a strip close to Pluto. The probe was kept in hibernation for more than two thirds of its trek and will is soon expected to finally explore the dwarf planet and, most importantly, the world that surrounds it – the Kuiper belt. It’s the farthest any spacecraft has gone to reach its primary target. 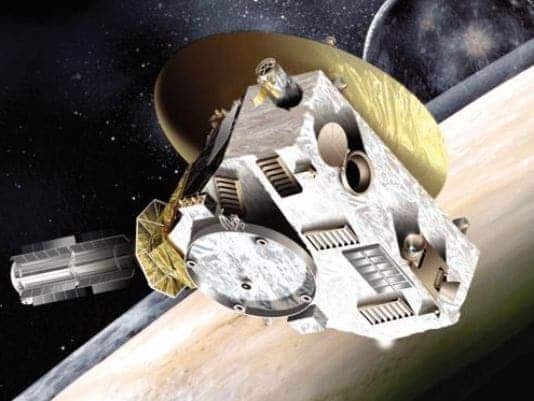 “This is a watershed event that signals the end of New Horizons crossing of a vast ocean of space to the very frontier of our solar system,” said Alan Stern, New Horizons principal investigator from Southwest Research Institute. New Horizon launched from Earth on January 19, 2006 and since then has traveled 2.9 billion miles, passing by all the planets in our solar system the most recent of which was Neptune, in August. During the 1,873 days since it embarked on its epic journey, the probe has been mostly kept asleep to preserve instruments integrity and prevent any failures. The hibernation was intermittent however, as the probe was briefly awoken 18 times to check its status only for engineers to put it back to sleep for periods ranging between 36 and 202 days. Nearing the end of its journey, the probe is just 162 million miles from Pluto. Today, at 9:53 p.m. EST, engineers at the John Hopkins University Applied Physics Laboratory awoke New Horizon once again for its longest expected period of activity, reporting all systems all in perfect order. The team tested infrared and ultraviolet imaging spectrometers, a compact multicolour camera, a high-resolution telescopic camera, two powerful particle spectrometers and a space dust detector. Scientists were a bit tense with expectation, however, since at such a vast distance it takes 4 hours and 26 minutes for the signal to transit between New Horizons and the NASA Deep Space Network in Canberra, Australia. So, what’s this big deal all about? Near the very outer edge of our solar system, Pluto, its moons and the mysterious Kuiper belt are very poorly understood. During its mission, New Horizon will beam back exclusive photos and chemical signatures, impossible to read at this level of detail with other instruments like the Hubble Telescope. Pluto has five moons: Charon, Hydra, Nix, Kerberos and Styx. But just so you can get an idea of how blurry our view of Pluto is, one of its satellites, Styx, was only discovered a few years ago. 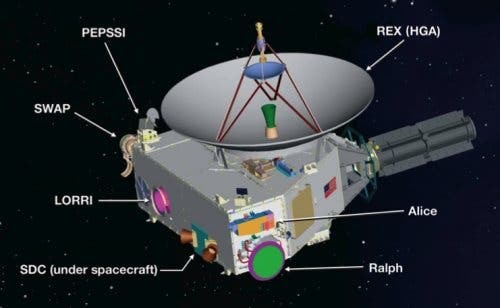 Approach Phase 1: 180 to 100 days before closest approach (Jan 6-Apr 4; range to Pluto is 226-121 million km). SWAP and PEPSSI will measure plasma. LORRI will monitor motions of Pluto, Charon, and the smaller moons. Pluto is barely resolved. Approach Phase 2: 100 to 21 days before closest approach (Apr 4-Jun 23; range to Pluto is 121-26 million km). Add in color observations, and search for satellites and rings. The start of this phase is chosen to roughly coincide with the time when LORRI has better resolution than Hubble, but Pluto will still be only a few pixels across. Approach Phase 3: 21 to 1 days before closest approach (Jun 23-Jul 13; range to Pluto is 26-1.2 million km). Includes best, second-best, and third-best rotation coverage before closest approach, yielding the best global maps of Pluto and Charon. PEPSSI and SWAP may detect pickup ions and bow shock. LEISA and Alice can begin looking for variability in IR and UV. Search for clouds or hazes, tracking winds. Near Encounter Phase: -1 to +1 days (Jul 13-15, within 1.2 million km) — sequenced in 2008 and 2009. Most of the highest-priority observations. Departure Phase 1: 1 to 21 days after closest approach (Jul 15-Aug 4; range to Pluto is 1.2 to 24 million km). Remote sensing of Pluto and Charon is performed for only 1 rotation. SWAP and PEPSSI study magnetotail, pickup ions. REX studies nightside temperatures. Nix and Hydra high-phase observations. Search for rings. Departure Phase 2: 21 to 100 days after closest approach (Aug 5-Oct 22; range to Pluto is 24 to 119 million km). Departure Phase 3: 100 to 180 days after (Oct 22-Jan 1, 2016; range to Pluto is 119 to 203 million km). No remote sensing observations planned. Once it’s finished here, New Horizon will visit one or more Kuiper Belt Objects beyond Pluto. Here the probe will find objects believed to be representative of the material which condensed to form the other planets. Their growth into full sized planets was arrested early in the history of the solar system. Hence they hold clues about the distant past of the solar system and the chemical endowment of all the planets including our Earth. In the belt, there are billions of objects with a diameter greater than 10 km.